A life of art, media and innovation: Hubert Burda has made a name for himself around the world as an entrepreneur, editor-in-chief, publisher, art historian and pioneer. Today, the managing partner and publisher at Hubert Burda Media Holding is a symbol of the media corporation’s success. In the 2018 financial year, the company – which is wholly owned by the Burda family – reported adjusted external turnover of 2.66 billion euros. When Hubert Burda took over his father’s Offenburg publishing house in January 1987, the company was still recording a turnover of 500 million Deutschemarks. In 2010, he handed over operational control to CEO Paul-Bernhard Kallen. Hubert Burda knows how to negotiate different, seemingly opposing worlds: journalism, publishing and printing, even visual arts and literature. He has found that the motifs of one world can stimulate another. He initially identified the significance and power of images – as opposed to simple text – when looking at painting and sculpture. By applying this discovery to information media, he grasped the new opportunities that images offer as information carriers in print media but above all in digital networks. When he founded the news magazine Focus in 1993, he made German publishing history. Introducing an innovative news design with graphics and charts allowed him to convey complex content more rapidly. This fulfilled a phenomenon dubbed the “Iconic Turn” by art historian Gottfried Boehm and introduced to the general consciousness by Hubert Burda. He was one of the first publishers to recognise the transformative opportunities of the digital media revolution. At his instigation, Hubert Burda Media opened up to this market earlier than other companies (founding Focus Online in 1995, investing in Tomorrow Focus AG in 2001) and began to consistently align his company for the digital transformation. He is convinced that “Google and Facebook are today’s digital ‘wunderkammer’”. By building up and expanding a high-growth portfolio of digital companies, he turned the corporation into one of Europe’s leading digital media companies. In 2005, he launched Digital Life Design (DLD), Europe’s most important innovation conference and exchange for the digital world. Hubert Burda is proof that a media company with a future needs people and a corporate culture that combine a passion for media and innovation with tradition and commitment. “The success of an idea is decided not by a company’s size, but by its innovative spirit”, he explains. In recent years, Hubert Burda has published three books: “The Digital Wunderkammer” (2011) is the collected thoughts of an art historian and publisher on the significance of the “Iconic Turn” and the power of images. “Die Bunte Story” (“The Bunte Story”, 2012) tells of his life as a journalist and editor-in-chief of Bunte. In “Notizen zur Digitalen Revolution 1990–2015” (“Notes on the Digital Revolution 1990–2015”), he describes his learning process since 1990, which led him to unite the print publisher with a dynamic digital company to form a multimedia corporation. From 1997 until 2016, Hubert Burda was President of the Association of German Magazine Publishers (VDZ) and currently serves as its Honorary President. 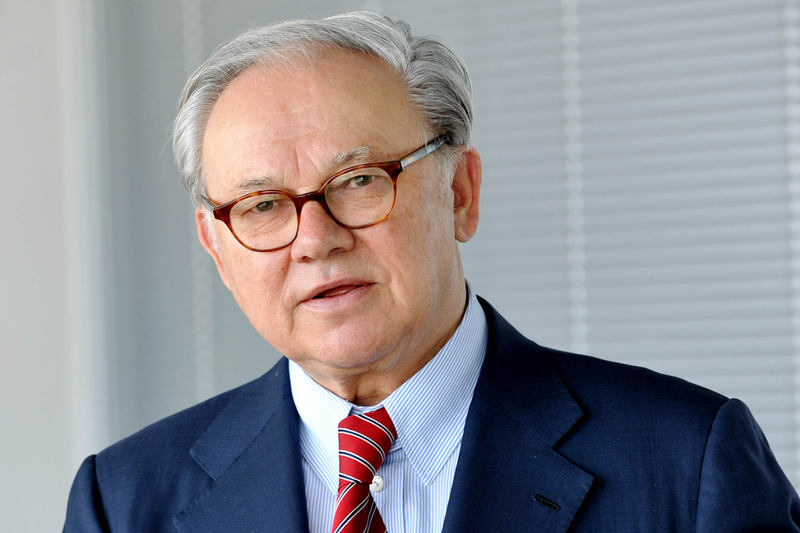 He founded the European Publishers Council (EPC) in 1991 and represents the interests of publishers at a national and international level. 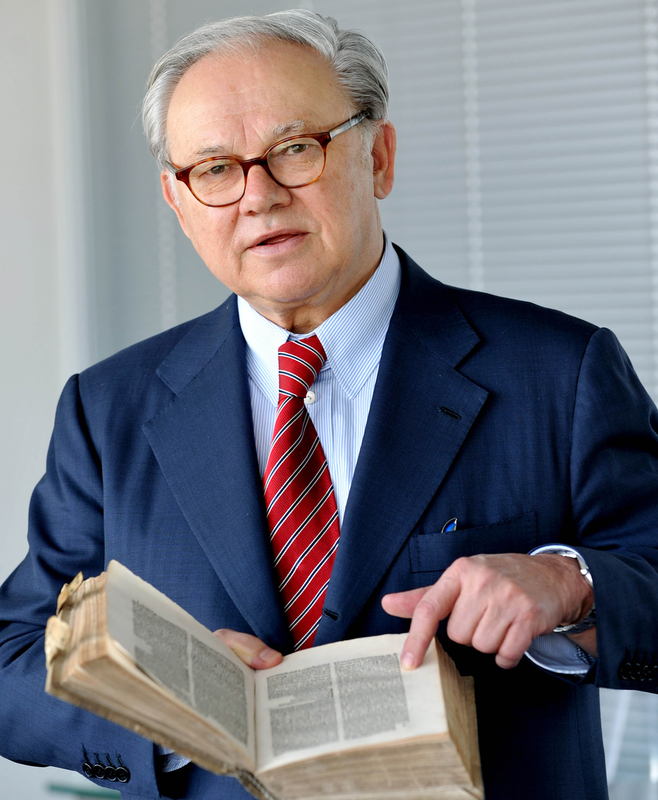 He initiated the Petrarca Prize for European literature and set up the Hubert Burda Foundation to promote interdisciplinary exchange on the topics of the future. Hubert Burda endowed the Senator Ehrenamtspreis (“Volunteering Award”) to honour dedicated volunteers in Offenburg. He presents the European Translator’s Award together with the City of Offenburg. He has received numerous honours for his achievements as a publisher and entrepreneur, including the Order of Merit of the Federal Republic of Germany and the Jakob Fugger Medal. He was appointed Honorary Senator of the College of Jewish Studies (Hochschule für Jüdische Studien) in Heidelberg in recognition of his promotion of the European centre of competence for Jewish studies. In 2012, he was made an Officer of the French Legion of Honour. Hubert Burda was born in Heidelberg on 9 February 1940. He studied art history, archaeology and sociology and received his Dr. phil. in 1966.